Professor Arthur Shapiro kicks off the first in a series of Humanities Lab lectures this Wednesday, September 20, at 1 p.m. at 228 Battelle-Tompkins. He will explore the difference between what we see and how we understand and interpret what we see, by using examples from his current laboratory research and award-winning visual illusions. "Illusions fascinate people because they create a conflict between perception and reality," says Shapiro, professor of psychology and computer science. 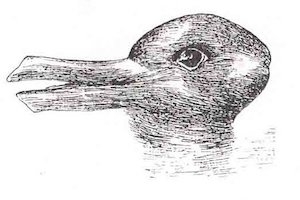 His work explains the complex workings of visual illusions such as the Duck-Rabbit illusion. It is an image that people see and interpret differently, sometimes seeing the rabbit, sometimes the duck, sometimes both at the same time. Philosopher Ludwig Wittgenstein used this image to describe the problem of perception as "seeing that" (It's a rabbit) and "seeing as" (I see this picture as a rabbit). Shapiro's work reveals the complex ways in which eye and brain processes negotiate this difference between "seeing that" and "seeing as." Shapiro is a vision scientist and an internationally acclaimed creator of visual illusions. His illusions have won more awards in the Neural Correlate Society's "Best Visual Illusion of the Year" contest. The National Geographic show Brain Games has featured several of Shapiro's illusions. The event is the first in a series of four lectures this semester sponsored and organized by American University's Humanities Lab. This event is free and open to the public. Students are especially welcome. Guests are invited for lunch: refreshments will be served at 12:45 p.m. The Humanities Lab's lecture theme for the year is Revolutions: Culture, Technology, Politics. Two historical events anchor the series: the 100 years of the Russian revolution in October 1917, and the 200 years of the publication of Frankenstein in January 1818. The lectures all involve bodies, technology, technological bodies, revolution, perception, and art. Wednesday September 20, 2017, 1 p.m., refreshments at 12:45 p.m.
Wednesday October 4, 2017, 1 p.m., refreshments at 12:45 p.m.
Wednesday October 25, 2017, 1 p.m., refreshments at 12:45 p.m.
Wednesday November 8, 2017, 1 p.m., refreshments at 12:45 p.m.